Phase One and Leaf-Mamiya Official User to User Forum • View topic - Choice: P25 or P30? I found the P30 better at recording chroma in the shadows and about 1 stop more sensitive. The shots from the P30 and P25 showed similar detail despite the difference in pixel count. What I'm waiting for is a P35 (guessing) large chip to preserve my wide angle shooting with 6.9 micron pixels, dual readout and microlenses for extra sensitivity. My P25 is fine until such a back exists. If someone offered a straight swap of P30 for my P25 I'd do it - just. I think the value of the two backs is the same. And P25 having more Image circle than P30 counts alot. As far as fashion is concerned or any Hoarding U can deffinetly count on P25. That does not mean P30 wont handle anything, it surely can do the same but with less image area to grasp. Medium Format is all about bigger image area and for your fashion work u wont be needing more than 22 megapixels thats more than enough. As for color rendering is concerned they (P series) are from the same family but with minor changes to all. I,ve not tested P30 but can garentee u it will work flawless because i,ve used most of the Digital Backs of Phase One H5 H 20 H25 P25 and the latest P-45 on my Hasselblad 503CW /FlexBody and 905SWC currently i,ve got H25 and P45 and both are great. Thanks Chris, but I'm in the UK! I'm currently considering a swap from P25 to P30 just for the useable 800 iso and the speed increase in shooting. The inconvenience of larger file sizes for no resolution increase together with a smaller CCD are the two drawbacks that spring to mind. I've read about the P30 being soft. I think the smoothness of tone and lack of noise is causing this apparent softness. I did an extensive side by side comparison today at 400 ISO and I recon the P30 gives a more pleasing look but you have to switch off the noise supression to get all the detail. I'm not sure which back is the most expensive the P30 or the P25. I think if I was starting from scratch I'd go P30. If the P45 had microlenses it would be my choice. Michael, you say your objective is very large prints. I use a P25 with Hasselblad V outfit and a Linhof M679 outfit, and I also use a Canon 1Ds MkII. 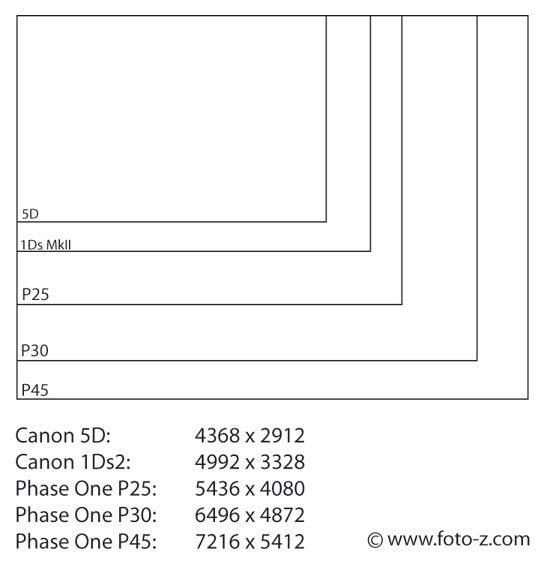 If your main objective is very large print sizes then you may be disapointed in the relatively small practical difference between a P25 and a Canon 1Ds MkII. If your objective was to use extreme movements with a technical camera, or take advantage of the unique properties of the Hasselblad 903 SWC Biogon lens, or simply enjoy waist level viewing with the wonderful Hasselblad Acute Matte screens then I'd suggest the move to a P25 would make sense. But if you're motivated purely by print dimensions then you may be better waiting for refurbished P45 backs to arrive on the market. Maybe this will help to compare. This is a 'to scale' comparison of IMAGE SIZES, not sensor sizes. You can see why the P25 is not a big jump from the 1Ds2 when it comes to maximum print size. I did a fashion shoot with a 1dsmk2 last week and I was amazed at how poor the processed image was compared to my P25. I loved the auto focus at the time of shooting -very cool, it lit up like a Christmas tree and was very fast. However it was when I processed the images I realised the focus zones were a bit of a lottery. All in all it was a competent camera but a bit heavier than my H1 and with a much darker and smaller viewfinder. The P25 is a class above the Canon in terms of overall image quality. The loaned P30 went back yesterday with another 2000 frames on it's counter. My P25 is back on my H1 and I'm glad. I'm glad because I have so much more image in my viewfinder and I have the same amount of detail in my shots. I can live with the noise at 400 on the P25, after all it isn't ugly noise. It's a bit filmic really. I put a 4gb CF card in the back and wow so many more shots available than with the P30. Re: Choice: P25 or P30? The P30 Does NOT ISO 50, the P25 does!